Buffalo hunters took the hides and choice cuts of meat, leaving behind the bones of the thousands of animals they killed. 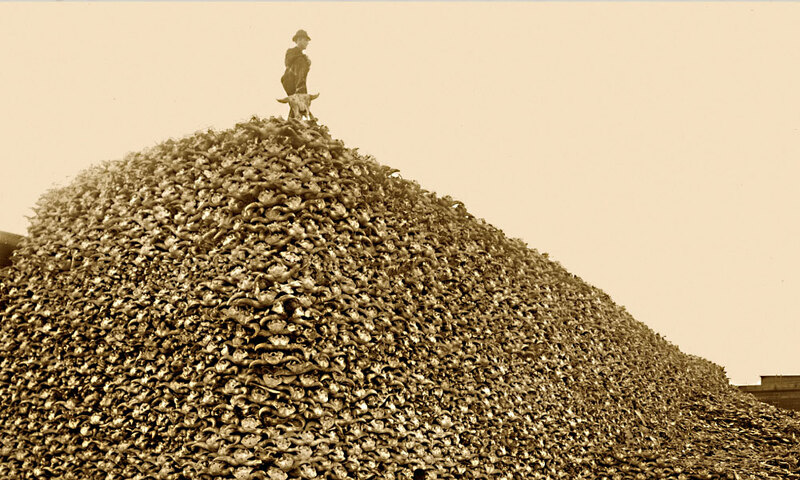 This pile of skulls is a graphic example of the destruction of the great plains herds. A bull bison looked at me from the diorama at the Boot Hill Museum in Dodge City, Kansas, when I began to hear a rumble. As the sound in the room grew louder, a herd (pun intended) of elementary school students came rushing into the small room where I stood. The kids tumbled onto the floor as the rumble became louder and louder. “It’s a massage,” the kids yelled as they lay on the floor that had begun to shake along with the rumble. On a series of four small monitors above the bison mount, Buck Taylor (you might remember him as Newly on Gunsmoke) and Dodge City spokesman Brett Harris shared stories of the bison that once roamed by the hundreds of thousands across the plains. When images from the film Dances with Wolves showing a bison hunt by American Indian hunters swept across the screens, the rumble of pounding hooves became louder and louder, the floor shook harder, and the school students yelled in delight. These youngsters may or may not have learned anything about the historic Great Plains bison herds, but they almost certainly went home talking about the experience they had at the museum. But Boot Hill Museum has more to represent the era of the buffalo hunters, including a display of buffalo hunter guns. Dodge City was a center of the buffalo trade in the 1870s when Josiah Wright Mooar arrived. 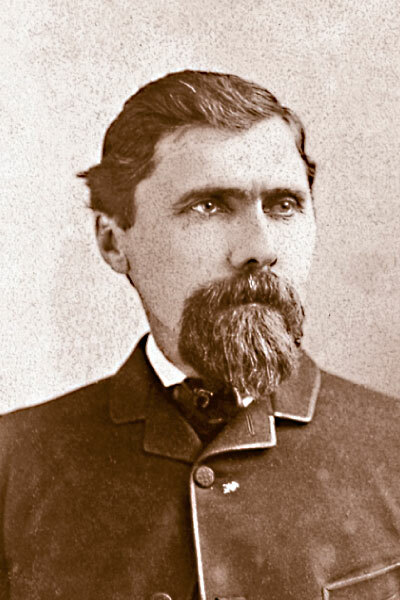 Born in Pownal, Vermont, Wright left home at age 19 and after spending some time attending school in Michigan, and then working in Illinois, he went west to Hays City, Kansas, where he found work cutting firewood for use at Fort Hays. 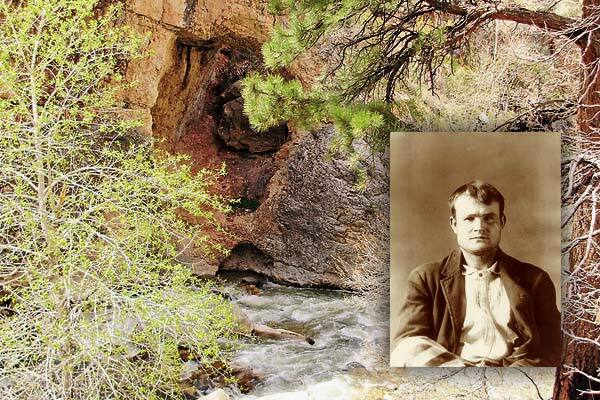 He saved enough money to buy a buffalo hunting outfit, and with three wagons and four hired hunter/skinners set out in search of the Great Plains herd along the Smoky Hill River. Wright worked his way south to Fort Dodge, and caught a break in 1871-’72 when Charles Rath, a freighter and hunter, received an order for 500 buffalo hides for an English tannery. Rath enlisted the aid of Wright Mooar in providing the requisite number of hides. When the hides to fill the English order were shipped to New York City some left over were hauled through town in an open wagon. A Pennsylvania tanner saw them, and at the urging of Wright’s older brother, John Wesley Mooar, who worked in New York City, the tanner bought the excess hides. After processing, he liked the leather so much that he placed a new order for 2,000 more hides. This kind of enterprise required serious commitment, so John Wesley Mooar quit his job and joined Wright to handle the business end of buffalo hunting, arriving in Dodge City in November 1872. The tracks of bison in soft soil have been preserved in a concrete cast and are displayed at the Heart of West Texas Museum in Colorado City, Texas, recognizing the thousands of animals that created buffalo trails across West Texas. An accompanying historical marker recognizes the trails to watering holes, as well as the hunting achievements of Wright and John Mooar, who became residents of the area. 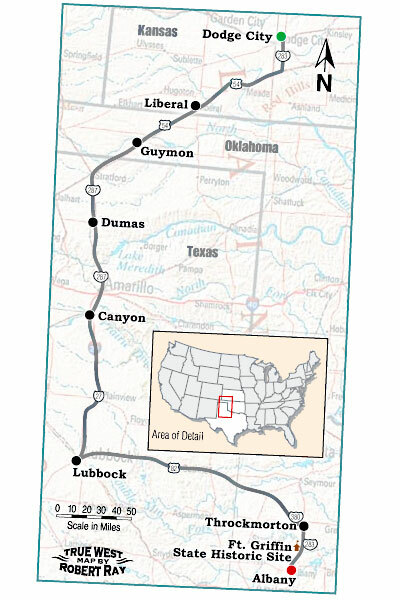 My route takes me south from Dodge City and Fort Dodge across the Oklahoma Panhandle, and into the Texas Panhandle, where the Mooar brothers hunted in 1873 and 1874. These and other buffalo hunters constructed a trading post they called Adobe Walls, about a mile from the earlier fort of the same name. As they hunted through the country, the Mooars had brushes with Indians, but they loaded their wagons with hides and set off for Dodge City without incident, barely missing involvement at the Second Battle at Adobe Walls, and the seemingly miraculous long-distance shot by Billy Dixon that killed a Comanche and became a pivotal moment in the conflict. This fight resulted in the subsequent attack on Comanches in Palo Duro Canyon in 1874 by Col. Ranald S. Mackenzie, who not only routed the tribesmen, but also killed about a thousand of their horses, ultimately forcing the Comanches out of West Texas and onto a reservation in Oklahoma Territory. The Mooars and other buffalo hunters now had a much safer area in which to ply their weapons and they killed thousands upon thousands of head of bison, ultimately working their way east to the country along the Brazos River and Fort Griffin, which had been established in 1867. My journey takes me to Canyon, Texas, near Palo Duro Canyon and home of the Panhandle-Plains Historical Museum with its outstanding murals by Harold Bugbee depicting some of the buffalo hunter legacy. From Canyon, I headed south to Lubbock and the History Museum at Texas Tech, where History Curator Henry Crawford, who often appears as a buffalo hunter re-enactor in living history programs, takes me into the archival collections for a view of personal items that belonged to John Wesley and Wright Mooar, including John’s gun, photographs and even a teething ring! 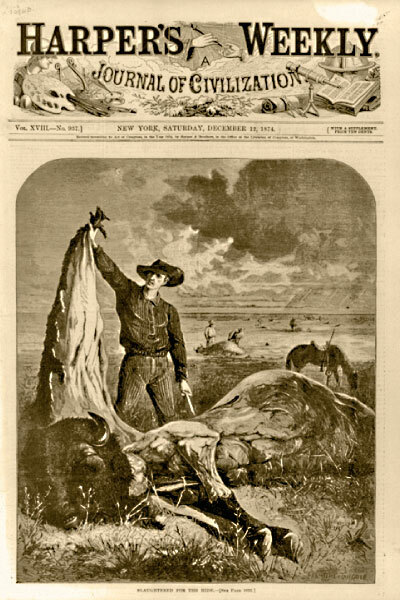 The killing and skinning of buffalo by the thousands for the use of their hides in the eastern factories was a front page story in Harper’s Weekly, December 18, 1874. Heading east from Lubbock, I drive through the country where the big buffalo herds once roamed. I’m on my way to Fort Griffin, which has just opened a new visitors’ center that tells the story of the buffalo hunters, the Comanche and Kiowa Indians, the frontier military and the early settlers in the area around Albany, Texas. Each October the fort comes to life when modern-day re-enactors set up camp and share stories of the people who were at Fort Griffin in the 19th century. Located on a high plateau, Fort Griffin provides a stunning view of a landscape in many ways little changed from the days when Wright and John Mooar hunted buffalo in the area. Fort Griffin State Park and Historic Site represents primarily the military era, with a nod or two to the buffalo hunters. The civilian side of life in the region during the 19th century is down the hill at the town of Fort Griffin, known as The Flat. There you’ll see the original jail in a community that was pretty raucous in its heyday. 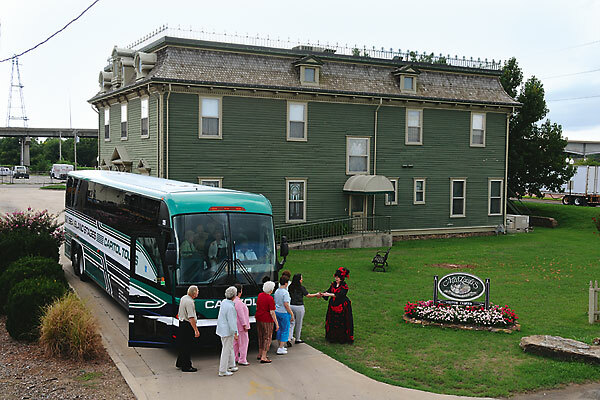 If you ask at the visitors’ center, they can give directions to other historic sites in the area, including a Comanche treaty ground. 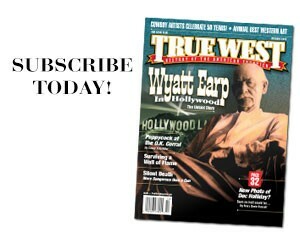 Mooar would eventually hunt as far south as Fort Concho, and had already hunted in the area west to Palo Duro Canyon. In 1878 Wright hauled a load of buffalo meat to Prescott, Arizona, and later he took a delivery to Colorado City, Texas. But the bison herds were soon decimated, destroying a way of life for the native people of the region as well as the hunters who had shot themselves out of a business. 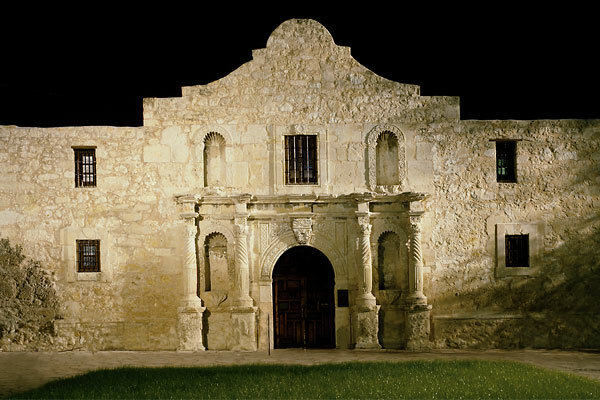 The brothers married and ultimately settled in West Texas. John sold carriages and owned land in Colorado City and Wright ranched near Snyder. 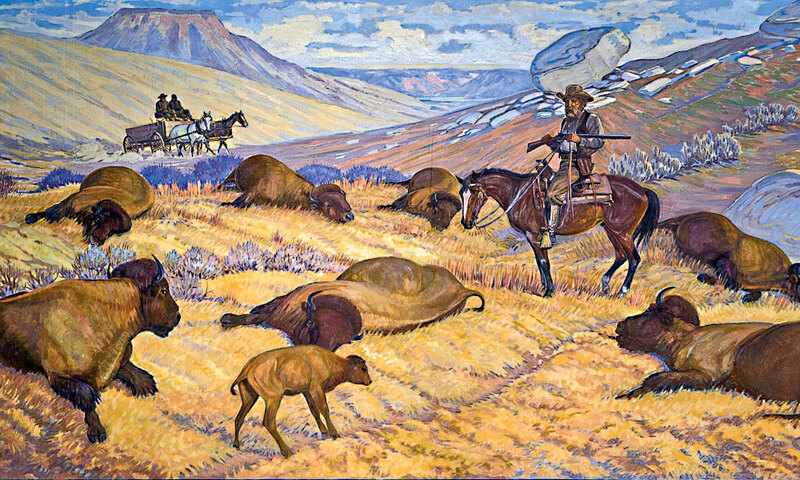 Renowned Texas artist Harold Dow Bugbee’s 1956 mural Hide Hunters can be seen on a tour of exhibits on the history of buffalo at the Panhandle-Plains Historical Museum’s in Canyon, Texas. In one of her other lives, road warrior Candy Moulton creates exhibits and films for museums and visitors’ centers. She wrote and produced the new interpretive film for Fort Griffin State Historic Site. Kaycee, Wyoming Bloody Johnson County is home to Butch Cassidy’s legendary Hole-in-the-Wall hideout. Tracking the Texas Rangers A Hill Country road trip following John Coffee Hays, Ira Aten and other top Texas Rangers.